This document states the Department of Chemistry’s policy and procedure against the illegal downloading of copyright material using the Cambridge University Data Network (CUDN). This policy targets the copying of any files from sources on the internet for which the user does not have an explicit licence to copy (known as copyright infringement). It is expressly forbidden for IT users in this Department to download copyright material for which they do not have a licence. When members of this Department and their visitors use the CUDN to download files, this is often done using peer-to-peer file sharing technology which simultaneously uploads the media. As well as downloading the copyrighted files themselves, users are often also sharing files for others to download. Organisations (e.g. Sony Corporation, Warner Bros., etc.) that hold the copyright to material (e.g. films) protect their assets by identifying those individuals who use file-sharing software to illegally obtain copyright material, as this could represent significant loss of revenue for them. The University of Cambridge has a clearly identifiable internet presence such that any illegal file sharing by its staff or students can be easily traced. When such activity occurs the University receives an official complaint from the copyright holder in the form of a Copyright Infringement Notice, which means the University is then vulnerable to litigation. When a Copyright Infringement Notice is received, the source of the infringement (the Department or College) is notified. Departments and Colleges who are shown not to deal with the infringement, especially when repeat offences are detected, run the risk of being disconnected from the CUDN. For this reason, it is expressly forbidden for IT users in this Department to download copyright material for which they do not have a licence. Any repeat offences run the very real risk of the Department of Chemistry losing access to the CUDN and thereby to the internet. This policy applies to all members of the Department, including Research Collaborators and visitors, who have access to any Department of Chemistry IT resources. Principal investigators (Academic staff) and Emeritus staff are expected to be upholders of the policy. As such, if they are shown to transgress the policy then their actions will come under greater scrutiny. The Department of Chemistry forbids the illegal copying or downloading of copyright material by users who do not have licence to access. 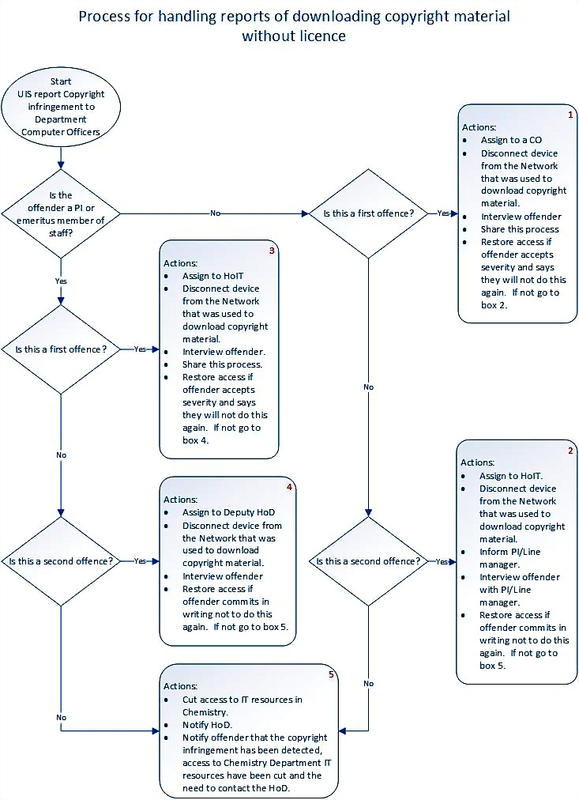 If reports of copyright infringement are received from the University Information Services, the Computer Officers will follow a defined process (outlined below) to deal with the offence. Repeat offences by anyone will result in the most stringent measures being pursued.